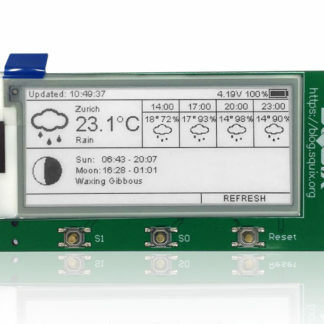 View cart “2.9″ ESPaper Plus Kit, WiFi ePaper display” has been added to your cart. 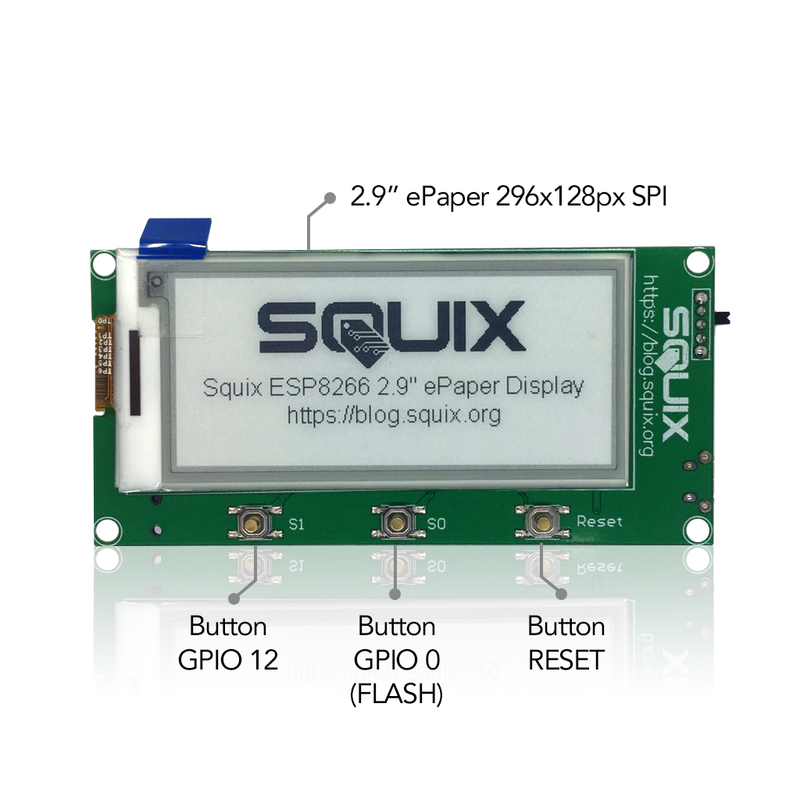 The 2.9″ ESPaper Lite Kit is the little sister of our fully assembled WiFi ePaper display kit. 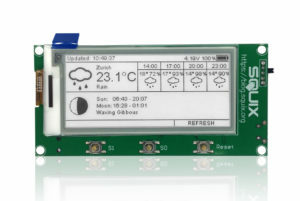 Weather station software is provided as a sample application. 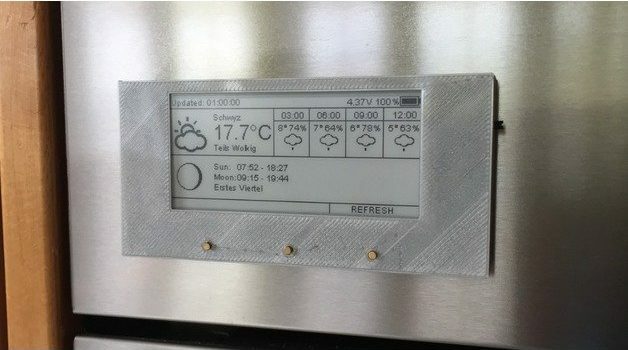 Thanks to the passive nature of the ePaper display it runs for months on a single charge. In order to program it you need an external USB-to-Serial converter which supports 3.3V. We recommend a Serial-To-USB-Converter from Banggood. 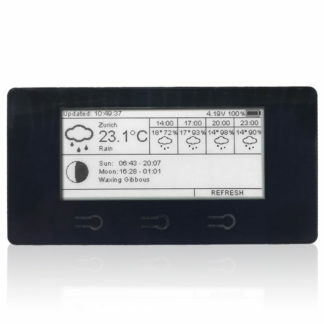 The 2.9″ ESPaper module displays data retrieved over WiFi on an ePaper display. 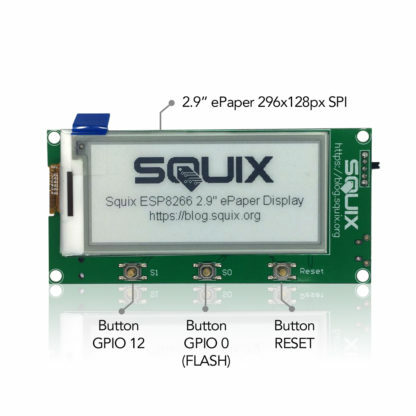 The integrated ESP8266 Wroom-02 module updates the 296×128 black & which ePaper display over the SPI bus. 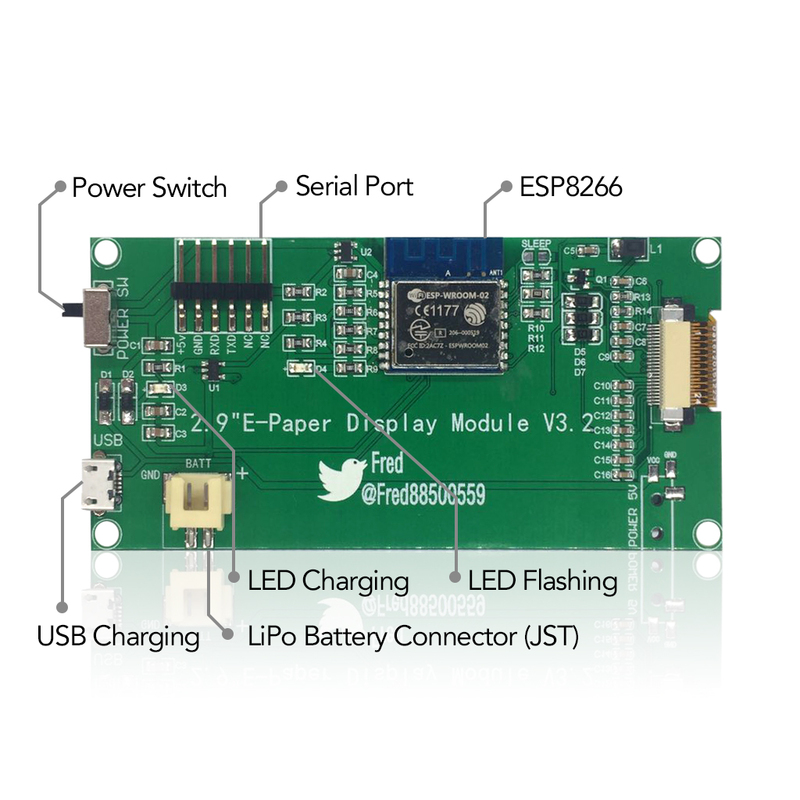 The module also features a charging circuit for LiPo batteries and a JST connector. 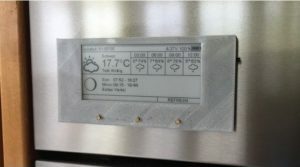 The passive nature of ePaper allows the module to run for weeks or even months from a battery on a single charge. Update frequency is almost exactly (inversely) proportional to total uptime. Tests showed a total uptime of several weeks for an update interval of 20 minutes. ThingPulse also provides a WeatherStation sample application to be loaded onto this WiFi ePaper display kit. The application only requires a handful of parameters and is ready to go. The open-source Minigrafx display driver library is also developed and maintained by ThingPulse. It offers examples for programming custom applications quickly. A very detailed step-by-step setup guide for this WiFi ePaper display kit is available online. If you’re stuck ThingPulse provides help through the support forum. 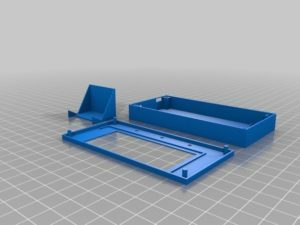 Great kit, easy to use, and excellent tutorials to get you up and running in minutes! Work perfectly!!! Very nice product and ultra very nice supprot!